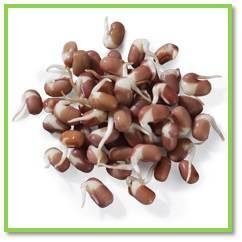 The Adzuki bean is a kidney-shaped bean with red shell. It is both protein, fiber and mineral rich and has a sweet sweetness. It comes from Japan where it is used in both cooking and baking. The bean is very easy to moss and is therefore used advantageously in vegetarian dishes where it is mashed to steaks or pies. Can also be used in salads, vegetable mixtures or to germinate.